Shakespeare’s plays have been adapted, rewritten, altered, reimagined for centuries, beginning just forty years or so after he died. These revisions keep Shakespeare fresh, giving the stories a modern flavour. Shakespeare himself borrowed stories from many other sources. As time has passed the plays have been turned into whatever kind of output was fashionable at the time: musicals, paintings, ballets, operas, movies and novels. Now the Hogarth Press, the publishing company founded by Virginia and Leonard Woolf in 1917, is launching a series of Shakespeare-inspired novels. These are to be written by bestselling and acclaimed authors, beginning with Jeanette Winterson whose take on The Winter’s Tale under the title The Gap of Time has just been published in over twenty countries. The Cheltenham Literary Festival features a couple of events relating to the series. Jeanette Winterson’s has already gone, but on Sunday 11 October 2015 at 10.30, in Reimagining Shakespeare, writers will discuss the creative processes behind retelling Shakespeare. Along with Tracy Chevalier, who is working on Othello for the project, there will be Iqbal Khan who has directed Othello for the RSC this year and Jane Smiley, Pulitzer Prize winner whose books include A Thousand Acres, based on King Lear. This video has several of the authors talking about the project and why they selected their particular plays. And this sound recording features Howard Jacobson and Jeanette Winterson discussing the project. London. England. After the financial crash. Leo Kaiser knows how to make money but he doesn’t know how to manage the jealousy he feels towards his best friend and his wife. Is his newborn baby even his? New Bohemia. Seventeen years later. A boy and a girl are falling in love but there’s a lot they don’t know about who they are and where they come from”. The Gap of Time vibrates with echoes of the original play but tells a contemporary story of betrayal, paranoia, redemption and hope…however far we have been separated, whatever is lost shall be found. “That night, storm and rain and the moon like a mandala when the clouds parted, it was the moon that made him know. The baby had lain like the visible corner of a folded map. Traced inside her, faded now, were parents she would never know and a life that had vanished. Alternative routes she wouldn’t take. People she would never meet. The would-be-that-wouldn’t-be. Because her mother or her father, or both, had left the map of her folded on the table and left the room. It was a map of discovery. There were no more North Poles or Atlantic Oceans or Americas. The moon had been visited. And the bottom of the sea”. Shakespeare’s play is never far away: one section is called “The spider in the cup”, and the man who adopts Perdita uses the money he finds with her to buy a bar called The Fleece. And at the end of the book Winterson moves seamlessly from the story into a few pages about her own feelings about Shakespeare’s play. “I wrote this cover version because the play has been a private text for me for more than thirty years. By that I mean part of the written wor(l)d I can’t live without; without, not in the sense of lack, but in the old sense of living outside of something. It’s a play about a foundling. And I am. It’s a play about forgiveness and a world of possible futures – and how forgiveness and the future are tied together in both directions. Time is reversible”. It’s a terrific start to a series that celebrates Shakespeare’s continuing influence and should introduce his plays to a new generation of readers across the world. 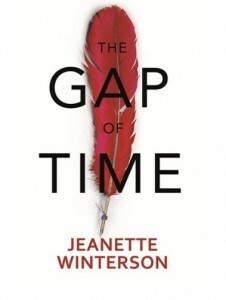 This entry was posted in Legacy and tagged Cheltenham Literary Festival, Hogarth Shakespeare, Jeanette Winterson, The Gap of Time, The Winter's Tale. Bookmark the permalink. I am really torn on this issue. Some of my favourite authors are involved in the project and I too have really enjoy over the years a re-telling of a Shakespeare play in various guises such as R & J film by Baz Luhrmann (and current “Macbeth” film) however I also feel we need to recognise the difference between an adaptation of a Shakespeare play and the simple reusing of a story-line which may or may not have originated with WS. The comment: “The Hogarth Shakespeare will be a unique series to delight existing Shakespeare lovers and bring the world’s favourite writer to a new readership, young and old….” Mmmmmm….not sure about that premise, taking a story line vs adaptation may be splitting hairs but there is wide chasm in my humble opinion. I simply dislike when “Shakespeare” is appended to some production that bears little or no resemblance to what HE produced. I don’t mean to pre-judge the efforts mentioned above but I really doubt the consumers of that material will be rushing out to read Shakespeare’s original (?) work, I would love to be proven wrong. I think the following may be from one of your blogs but it says it all: James Shapiro, a professor of English at Columbia University, used a regionally apt analogy to express this opinion: “Shakespeare is about the intoxicating richness of the language,” he told Oregon Public Broadcasting. “It’s like the beer I drink. I drink 8.2 per cent I.P.A., and by changing the language in this modernizing way, it’s basically shifting to Bud Light. Bud Light’s acceptable (at a stretch), but it just doesn’t pack the punch and the excitement and the intoxicating quality of that language.” I know this quote speaks to adaptations primarily but I think we can expand that even further to the genre of so-called re-telling of a Shakespeare story also.